I've just moved to Lafayette for a summer internship, and let's just say things are hectic. We'll see if 1) I end up having a computer at all and 2) if I have internet access for the summer in the coming weeks. I'll try to be back on here as soon as possible though! iMonk on the gospel. Honestly, what better thing to read about? A disclaimer though, this is a rant; aside from the occasional stream-of-consciousness-esque diatribe, it's a great read. Also, Daniel Hixon responds to Pontificator concerning tradition, sola scriptura, and ex catherda, among other things. A very different post from that on Internet Monk, but also definitely worth reading. reflecting on the politics of God & the politics of man. I just wrapped up this book by the late Jacques Ellul(whom I have blogged on before), and I thought I'd offer a few responses to it on here. God does not mechanize man. He gives him free play. Man is certainly not free in any degree. He is the slave of everything save God. Ellul uses this idea of freedom being found exclusively through Christ throughout the book, later describing the church as the only vehicle of this freedom to the world. The exposition of the interplay between God's freedom and man's liberty often leads to a discussion of the problem of evil, specifically evil done in the Lord's name; the explorations therein are worth reading. When criticized by the world, the church does not have to agree that the world is right and that it must take part in social and political action as the world advises. What it must see is that it has not been able to show with sufficient intransigence, rigor, absoluteness, holiness, and seperateness how different God is. As God does not fit into the molds that He would be expected to, the church is called to, being the person of Christ on earth now, enact this difference. Another interesting theme is that of human intent in accomplishing God's will, which, he asserts, we are constantly accomplishing, whether we are aware of it or not, and whether we intend to or not. He explores the account of Jehu in Second Kings 9-10 to examine this theme, and it was one of the most interesting chapters of the book to me. The theme is expanded in subsequent chapters as he examines the infamous "sin of Jeroboam" and what exactly he feels that this sin entails, both in the Old Testament accounts and today. So much more could be said about the book; this was really just a shoddy preview for any curious about Ellul. I'm still chewing on much that he says, and there's much, particularly concerning the relation of God's will to man's, that I whole-heartedly agree with. I'd certainly encourage anyone to pick this, or another of his works, up, not just for exposure to one of the last century's most influencial Christian thinkers, but because many of his ideas, if correct, have very weighty consequences on our life in Christ and in society. For more on Jacques Ellul, you can probably just check out Wikipedia. That's never really a bad idea. Christianity Today is hosting a debate between authors Douglas Wilson and Christopher Hitchens on the question of whether Christianity is good for the world. I'm always in favorof intelligent dialogue, especially considering Christian teachings are so relational; really, why not take the time to talk about this sort of stuff with people? That being said, I was left a little underwhelmed by Wilson's response(Hitchins, the atheist, makes the first remarks) in Part 1. As the arguements made by Hitchins are apparently typical of such a discussion, I felt that Wilson's return was lacking, seemingly unfair and dismissive. In Part 2, however, I felt that Wilson's point is better made. To really get to the good stuff in these articles though, check out the comments. That is where the real dialogue is happening. Read, consider, ask questions, reason--therein we find the ability to grow through this sort of dialogue. When questions are not put off or ignored, when you have to answer them, well, you have to figure out your answer. UPDATE: Here's a review from Christianity Today if you're looking for a little praise. They give the film a MUCH higher score than I would, but then again, judging by the reviewer's X-Men 3 and Return of the Jedi comments, I assume we would give very different scores on several films. Generally I only review films on here that I really like; sadly, this will have to be the exception. Still, it is Spider-Man 3, so I think a proper review is in order. I'm gonna speak pretty generally about the film for a bit and then get a little more in-depth with spoilers, but I'll warn you before the in-depth part. First things first: I am a comic fan. I have been my whole life(thank you Uncle Bryan), and Spider-Man has been one of my favorites over the years. For a look at the comic book rendition of what we find in Spidey 3, wikipedia is at your service. Try these links, but beware of movie plot leaking through the comic parallels: Venom and an article on the alien symbiote. Secondly let me just say that I've been a big fan of Sam Raimi's work on the two previous Spider-Man films. This had shaped up to be on of the best(if not the best) super-hero film franchises of all time. There is a LOT going on in this movie, with several sub-plots, and lots of characters(think Batman and Robin--I know, I painful thought--but that's the kind of sheer volume of characters that we're talking about). It picks up apparently a little after Spider-Man 2, with Pete and MJ's relationship and the Harry/Goblin plots being taken up. The movie gets right to it, and the plot and action as as busy in the first five minutes as in the last five. I was a pretty skeptical about the idea of having Venom in this film from pre-production, given the depth of that story's development in the comics, but the film tries to develop it all as well as it can and in a more familiar, modern scenario(more on that later), and this along with everything else leaves us with a pretty long film, at 140 minutes. Despite my initial reservations, I think that the Venom story is handled very well, and he definitely looks great. Sandman is also well presented, despite a weak origin scene, and more interestingly, more dramatically than ever he was in the comics. The story line that dropped the ball for me was actually the one I most anticipated: the symbiote and the black costume. The story's drama appropriately revolves much around the effect that the costume has on Peter, and is done very well at times, but for the most part is poorly executed. More in the spoilers section. The MJ/Peter plot remains interesting, but it doesn't make up for how bad the symbiote story was. In fact, all in all, much of the story is simply over-the-top, and I'm not even talking about the super-powers, etc. Character development in the villains, sans Harry, of course, is also really weak, given what their almost non-existent motives drive them to do. There are also two interesting themes running throughout the film that the audience is left to ponder: choices-free will, if you like-and forgiveness. There are some interesting images of these themes presented by some of the characters, but even these could have been more deeply and dramatically explored. I also have to say, Danny Elfman's score was sorely missed throughout. If you're only looking for a fun super-hero flick, Spider-Man 3 will probably deliver for you. The story is really entertaining for the most part, and while I cringed in several scenes, the average viewer will likely just find them humorous. The action sequences, especially the final battle in the film, are as well done or better than those in the previous two films. I was just hoping for more than that, something on par with the first two (fine)films. That, I don't believe 3 offers, and it's a pity given such strong source material. The film is certainly worth seeing, and not nearly as bad a sequel as last year's shipwreck, Pirates of the Caribbean 2: Dead Man's Chest, but I was hoping for considerably more than "worth seeing". Now, a little further, but with SPOILERS!! My major gripes with the film are a bit specific. While again, the Venom story is well presented, and the character looks great, the first half of that plot, Peter and the Black suit, is simply terrible. Peter decides to discard the alien symbiote suit once he recognizes the effects it has on his personality, augmenting all of his worst qualities, leaving him angry and violent. The scene in the jazz diner where he attacks the bouncer and eventually even strikes MJ WELL portrayed this. Everything else did not. The film makers decided that the best way to show us that Peter was now an angry person was not clever lines well executed by Maguire, but rather to make Peter emo. Emo. This does not have the dramatic effect desired, but rather evokes laughter from the audience everytime we see Parker. Are protagonist, struggling with base desires and inner demons is left like most early interpretations of Shakespeare's Shylock: a comic character. This, for me at least, completely ruins the drama and intrigue of the story. The resolution of the Peter/Harry plot was quite good in my opinion. It's very powerful and one major illustration of the theme of choices in the film. It also leads to one heckuva final battle scene that really felt like... a comic book. Well done. Annoyingly enough the film leaves many issues unresolved, and, just to save you time, no, Peter will not propose to MJ after the credits. No extra scenes(a la FF, Daredevil, X-Men 3, etc.) here. It ends simply with them being on good terms, and I for one was hoping for much more than that. Of course, again, they are already stuffing a LOT of action in this film, and there are time contraints, like it or not. 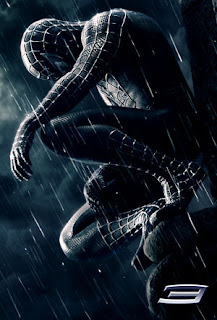 Spider-Man 3 could have been, to comic fans and movie-goers alike, the best comic film ever made. The story that they ran with is just that good. But Raimi and co. simply dropped the ball, as much as I hate to say it. Fun, I guess, although I did not exaggerate when claiming to have cringed several times(Emo-Spidey), but not a good film like it's predecessors. It ends strong, almost as strong as Spider-Man 2, but that just couldn't make up for everything that the packed house had to sit through up till that point.